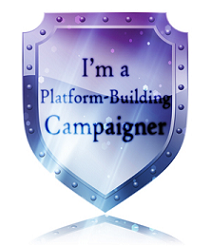 Today starts the second challenge of the Writer's Platform Building Campaign. It's a bit of a dozy, five prompts were given as well as five different guidelines of what to do with them. Participates can use one, all, or some of the prompts, with same rules applying to what to do with them. With the added challenge where if you do more than on option you can have a common theme. I tried to use all of the prompt for both challenges. The first is flash fiction, 200 words or less as usual. The second is a poem, 200 words or less, that had to end with a twist. I went with the theme of 'escape'. If you guys like my entries, go ahead a vote for me. I'm number #38. And if you want to view other entries, you can head over to the blog list. Hunter tried to convince Allison that the cut on his leg was small; he'd be kicking a ball around on the bridge soon. He failed. They knew shifting through the dump behind Soltech Industries was trespassing, but it was worth the risk. The money they would have made on the black market would have fed them for a week. Maybe cover some of Hunter's med bills too, stupid virus. His wife leaned him against a rusted bridge support, searched the area, and came back with a ratty infant's onesie. Hunter tried not to wince as she pressed it to his leg. The guard's battery sword had cut deep, and the leg had stopped supporting him. "Dive," Allison whispered in his ear. "Go surf. It'll push away the pain." He tried to avoid surfing the Web, it was how he got the virus, but she was right. So he dived, and like a water balloon filling with water until it burst, his mind grew and grew the deeper he dived until his world burst into the yellow lights of moving data packets. He dived into a familiar stream - photos collections of long dead friends from a happier time. I did enjoy your story! I was just a little confused by the first sentence and the transition into the second. And I enjoyed your poem! Very good! Nice. I like the "go surf" No idea that was coming. As for the poetry - so impressive! Hard to do. Gwen - great job. So creative with the web and getting the virus. And you also wrote a poem! You're very talented. Both great entries. Very creative story. I thought they were both kids until you mentioned his wife though. Could just say "kicking the ball around like a kid again" to correct that. The ending is a real mind-blower in a good way. I liked how your poem moved from higher to lower vantage point. The phrase "sea watered hair" got me. The last stanza is very powerful in the children's lack of it. Wonderful entries. I really love the poem. i'm telling you, this was great! you are past the first round! love the dive into the web with telepathy and how he caught a virus! awesome! I'm always awed by people who can write poetry effectively and not only tell a story, but create an atmosphere with the words chose to tell the story. Especially tough in a competition like this. Very impressive. I like that story. Very creative!!! Great poem, very creative! I liked the story too! There's a cyberpunk feel to your entries, very inventive. I like both a lot. It was awesome. You make me wish I could write like you! I liked your flash fiction piece better than your poem but both were good. I especially liked how seamlessly you worked in the prompts. good job! For a moment, I thought you mean the biological sort of virus. I loved that twist! Good job, sliding from water to Web - and yet, leaving the reader wondering which one you meant. Great job!! Loved the poem!! Nicely done. I thought you poem and story flowed beautifully.